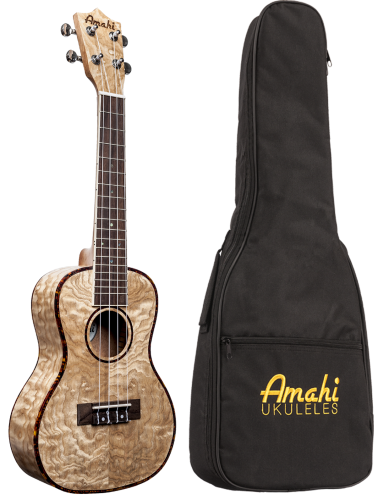 Amahi UK880C Quilted Ash Concert Ukulele w/Gig Bag by Amahi Be the first to review this item Price: $179.99 & FREE Shipping Only 1 left in stock. Get it as soon as Nov. 17 - 22 when you choose Economy Shipping at checkout. Ships from and sold by Butler Music LLC. Available in Concert. Finish: Satin Top, Back, and Sides: Laminated Quilted Ash. Tuners: Silver Die-Cast, Sealed. Additional Features: Shop Adjustment and 10mm Padded Bag.